On May Bank Holiday Monday this year, my boyfriend and I were kindly gifted with free tickets for the Foodies Festival at Hampton Court in London. We decided to go in spite of the predictably awful Bank Holiday weather forecast and were so glad we did as it turned out to be a surprisingly glorious hot and sunny day! We were hoping there was going to be a lot of free tasting opportunities and we really were not disappointed. We ate an obscene amount of food this day and I am almost ashamed to post about it! Almost. 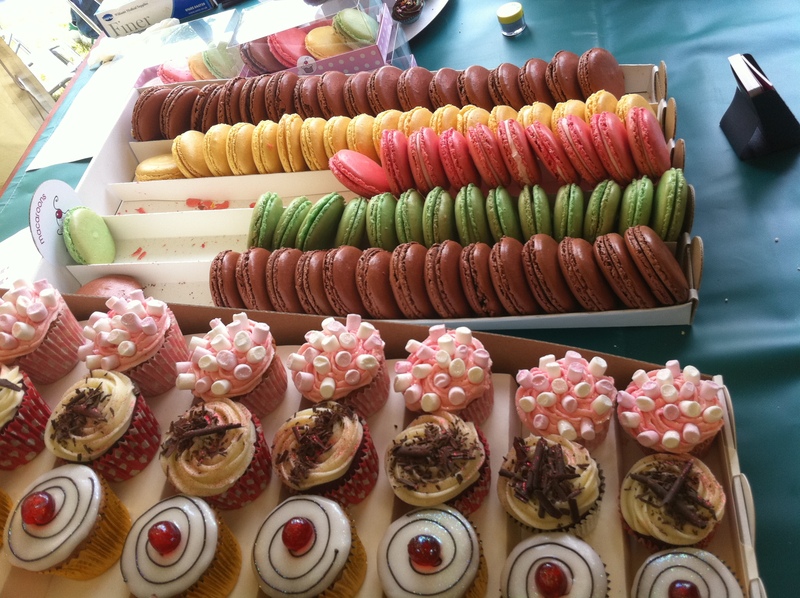 So, our day started by a browse through the Harvey Nichols tent which held lots of stalls all offering different kinds of foods. 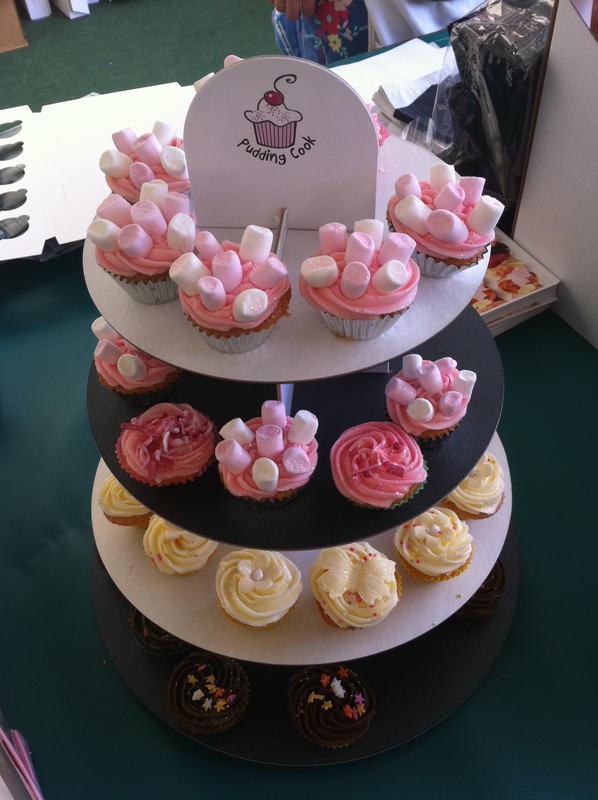 First stop was the cupcake stall where I went a little snap-happy due to the extreme cuteness of the sweets! Mmmm, delicious right? I wasn’t feeling the sweet at that moment though and fancied something savoury to start with so I said I’d go back and buy one later…but I never did! Hate when that happens. We’d already tried quite a few samples in the Harvey Nicks tent including some shots of flavoured alcoholic espresso drinks which were lovely but I needed something more substantial! So, we went in search of a tasty savoury treat for me to kickstart my eating. 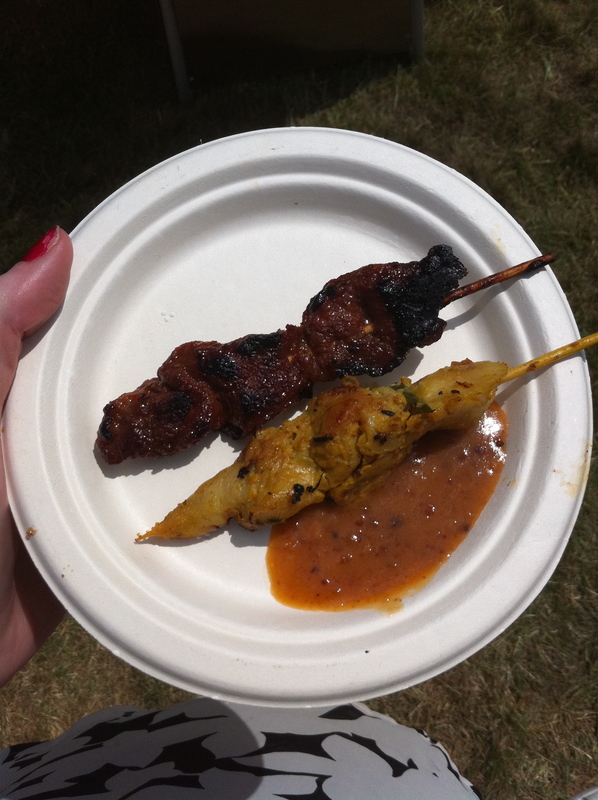 There was a chinese stall selling snack items for a bargainous £1.00 each so I got one chicken satay stick with extra satay sauce on the side, and one BBQ pork skewer. 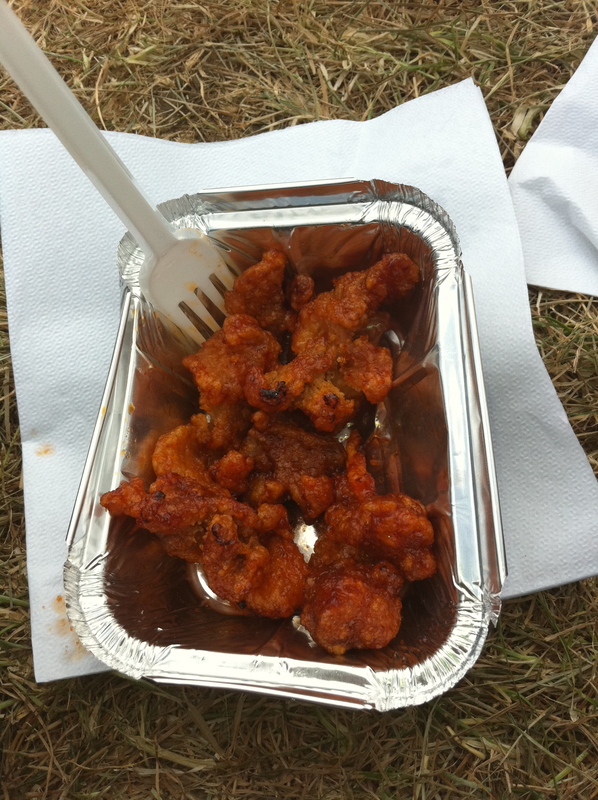 These were both really lovely but the chicken had the edge as the added satay sauce was amazing! The pork could have used a sauce of its own as it was a bit dry…but I forced it down! Pretty much straight after this we passed another Chinese stall and I just couldn’t resist getting another snack! This time we got four vegetarian spring rolls to share. 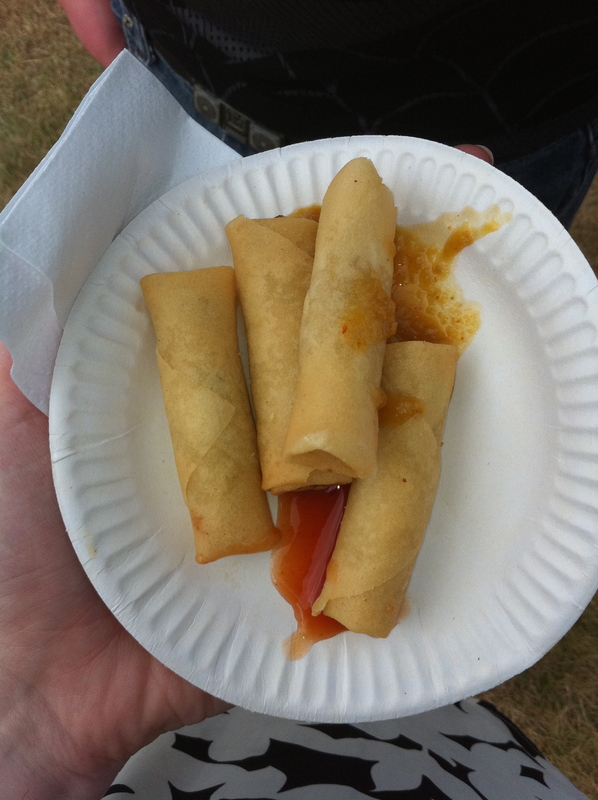 These were really good too with a crispy, flaky outside and a hot, mild filling of crunchy vegetables and beansprouts. We could choose two dipping sauces and I chose the satay sauce again while Ben chose sweet chilli. We paused for a second on the grass to eat our little snack, taking in the sights and sounds of what was turning out to be a fabulous day! 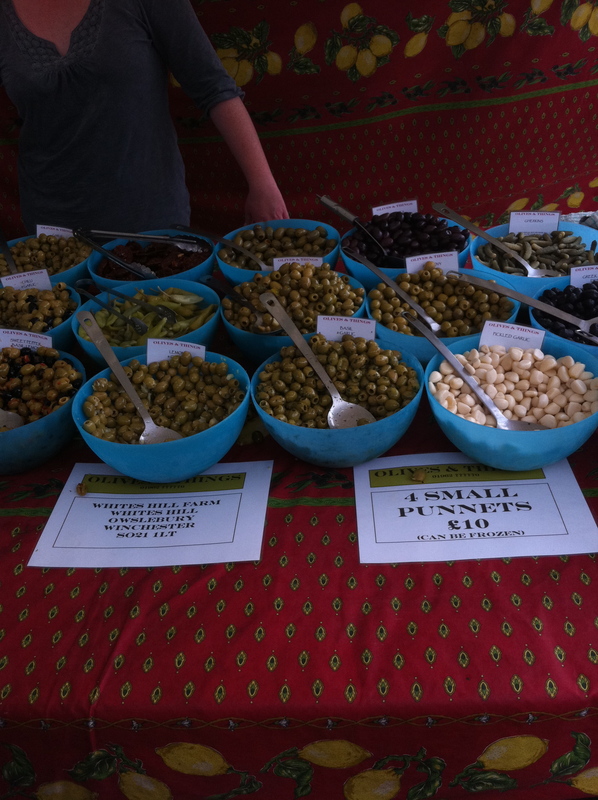 We continued around the stalls, trying each and every free sample we could get our hands on. 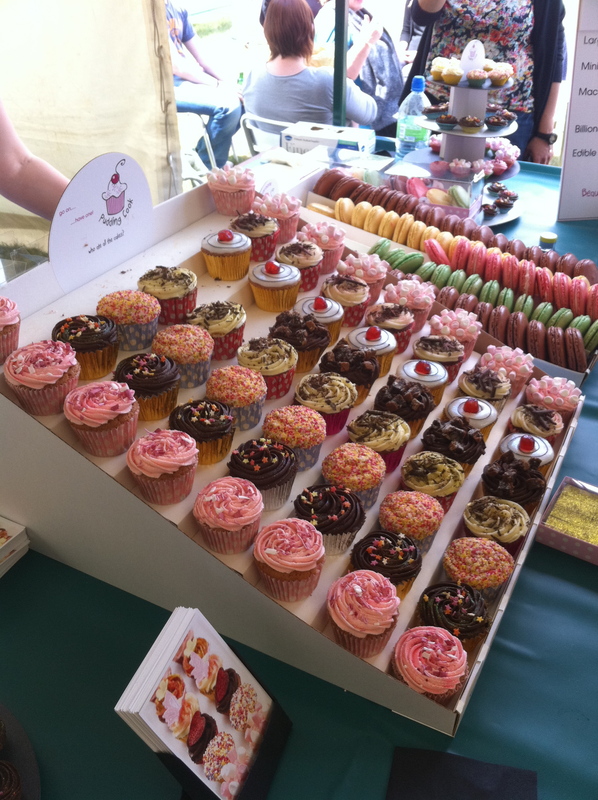 Some were a lot more generous than others and we found a few stalls that we repeated due to their portion sizes and yumminess! 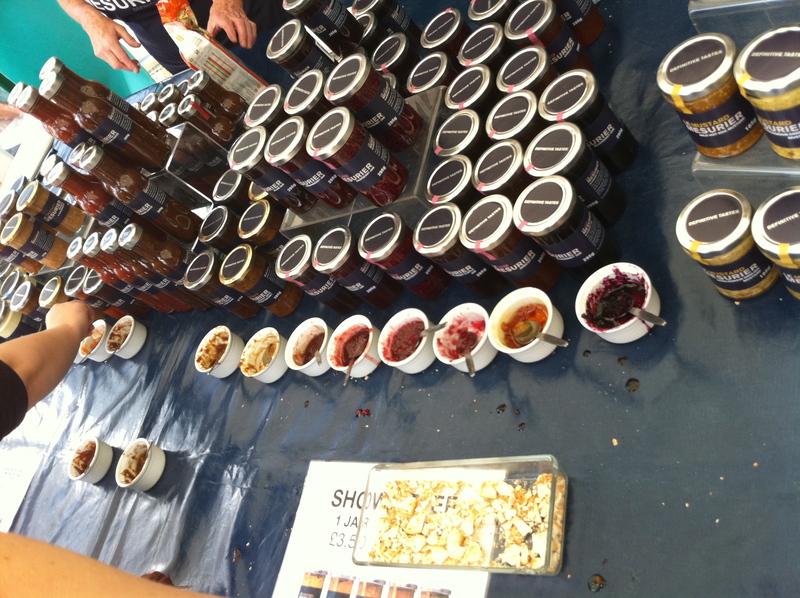 We were particularly keen on the stalls that were selling different kinds of chutneys and pickles as they were generous with their samples and it was so fun to pile all these flavours of chutneys onto crackers and bread, not really knowing how it was going to taste! I had a couple of bad experiences with mega spicy stuff but on the whole it was tasty! By this time I was ready for some proper lunch so we headed over to some of the stalls on the far end of the field that had caught our interest earlier. 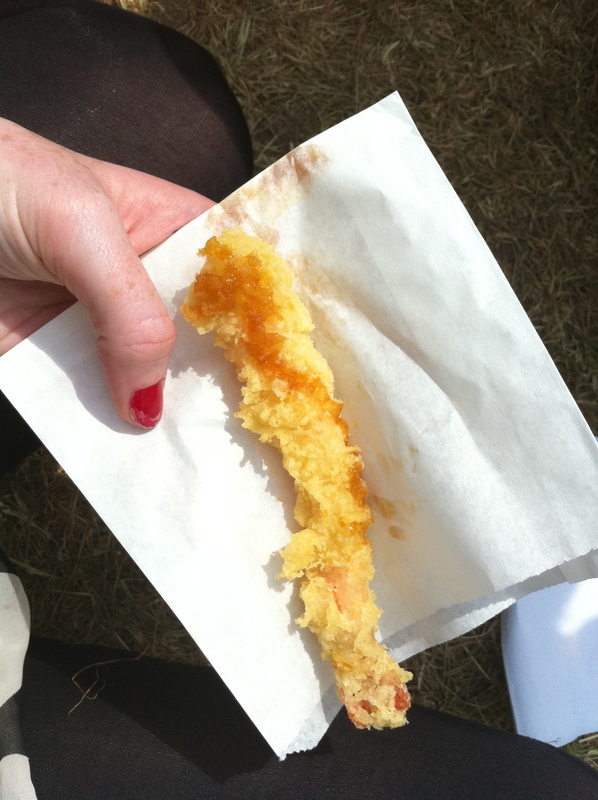 To start with I got a large battered shrimp (£1) and some crispy Chinese style chicken (£3) from the Chinese stall. The shrimp was AMAZING, hot and fresh with a drizzle of sweet and sour sauce on, delish! The chicken however…not so much. I think it had been cooked a while earlier because it was so dry and tasteless…ergh. I was really disappointed and only ate a couple pieces. So, I had to cheer myself up with something else! 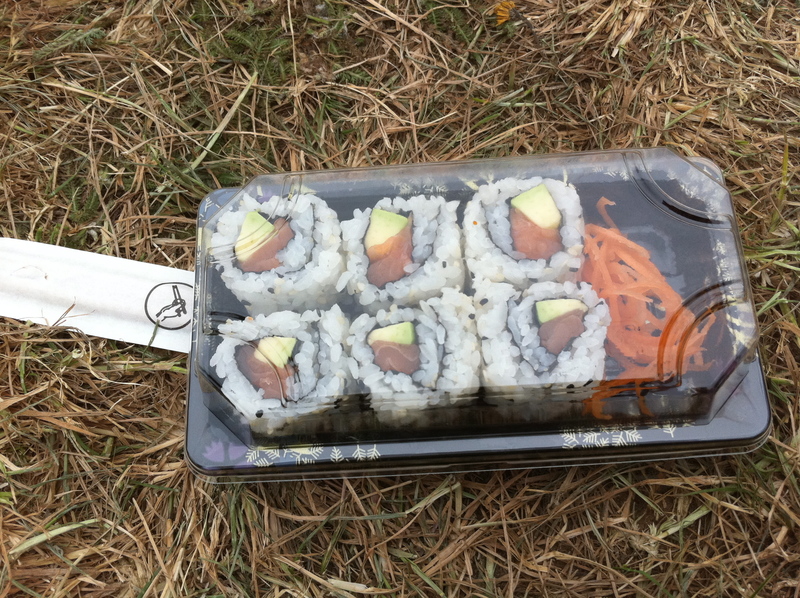 To cheer myself up, I headed over to the sushi stall we had passed earlier and got a serving of Avocado Rolls which were really good and definately helped improve my mood after the dry chicken! While I was messing about with a 3 course meal, Ben was busy ordering a falafal platter from one of the stalls that we’d noticed had a lot of activity around it. And, he was very pleased with his purchase! 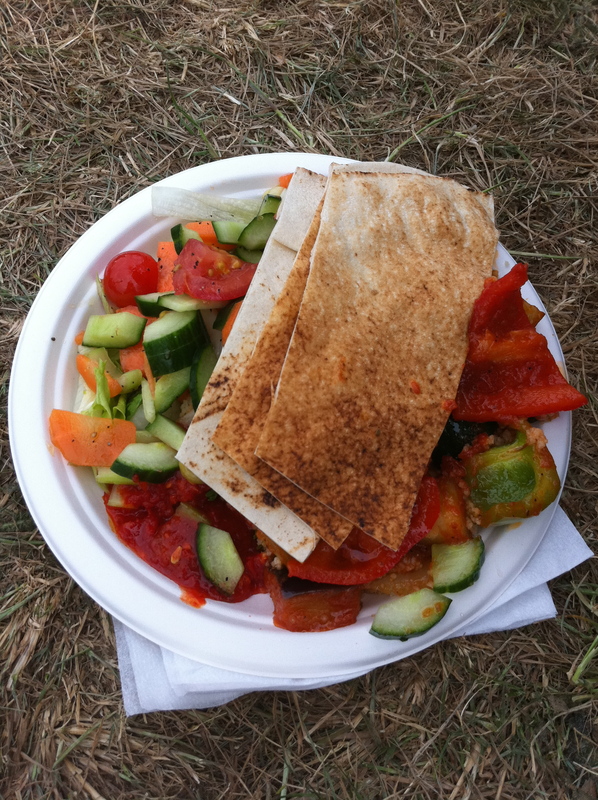 He ended up getting a huge plate of falafal with loads of crunchy veggies, thick, flavourful tomato sauce and a few pieces of flatbreads on top. I think this was all for £3.50, such a bargain! 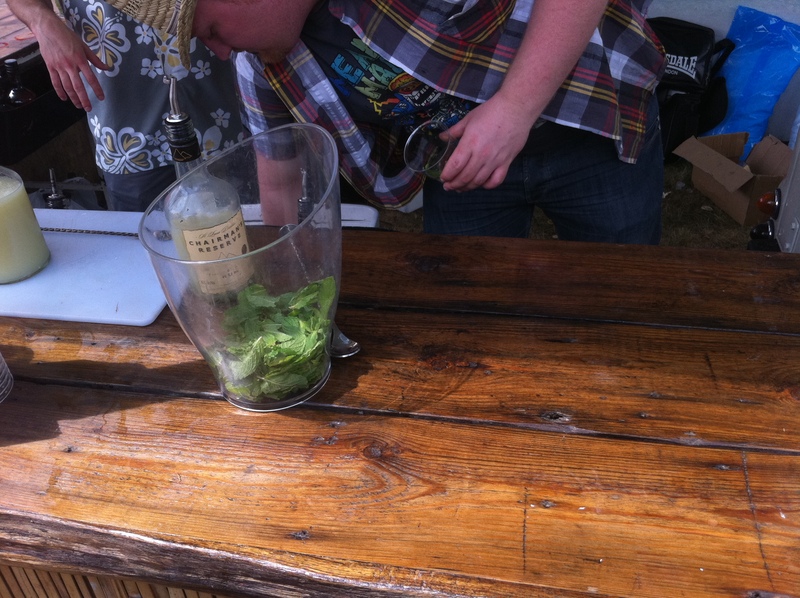 Throughout the day, Ben was also sampling the various alcoholic delights that were abound in the festival. He took a shine to the awesome Mojito stand that was run by two guys in a converted truck/stall with reggae music blaring out – easily the coolest stall that day! The mojitos weren’t cheap, but hey, you get what you pay for and he got a lot of bang for his buck in terms of alcohol – the mojito was mega strong! After making sure we’d checked and double checked (and triple checked!) all the stands, we began to make our way out of the festival (getting briefly annoyed as I walked past the sushi stall to the sounds of “half price sushi!” grrr) and back to the car, just as the heavens opened on what had been a perfect summers day. 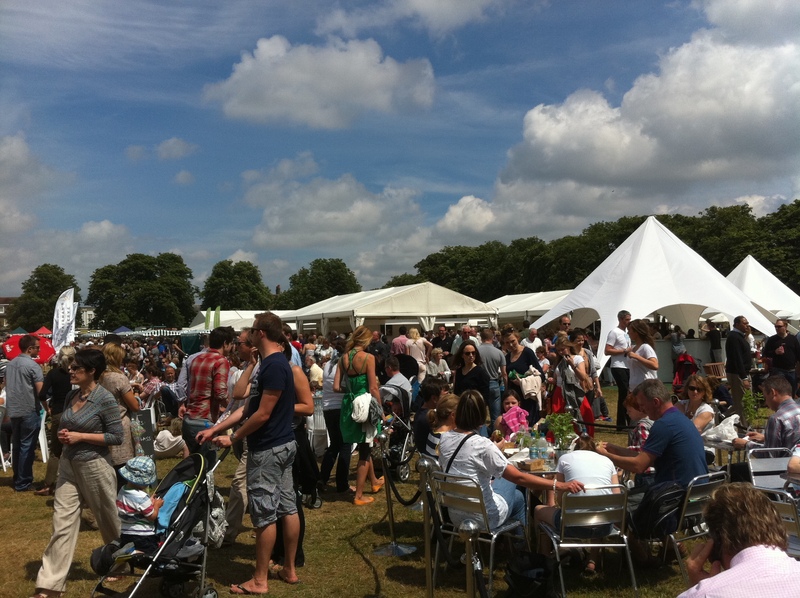 A lovely way to spend a sunny Bank Holiday, we will definitely be attending the next Foodies Festival!